Tonight I finished up my submission for the Money Swap at the Carving Consortium. 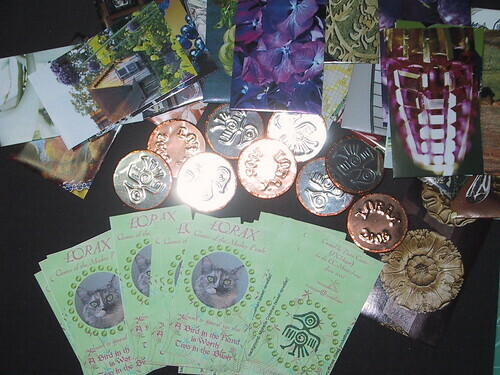 The task was to create currency--pretty open-ended :-) I decided early on that I wanted to make coins instead of paper. It took a while and some messing around to decide just how I was going to accomplish this. After several false starts, I ended up embossing metal, adhering it to wooden nickels, and covering the edges with stained-glass copper tape. I wish they were heavier, but I like the size and especially The Shiny! I bought some thin metal sheets and started playing. I stamped my pattern on one side and used an embossing stylus to trace the pattern, which makes it raised on the other side. I made all the "bird" sides on the pewter sheets, and then carved my LORAX - 2006 stamp and started on the brass. Well, it didn't take long to realize that the habit of carving letters backwards so they print frontwards was a bad habit in this case! I'm not a very accomplished letter-carver in the first place, and I wasn't about to try to recarve the stamp "frontways" so I let the project sit for a day while I thought. I finally figured that I could stamp onto paper and emboss through the paper onto the metal. Crisis averted! Around this time, it also occurred to me that it was not at all obvious that I had actually done any stamping, much less carving. Not only that, I didn't leave myself any space to put my name or the date or any other standard swap-type stuff. Sooooooo, I decided to make an accompanying card. On the front I put a message from Lorax Herself, and I put all that other business on the back, including an impression of the bird stamp.